According to the rail budget 2016-17 it seems that the railway minister is all set to provide a bunch of new trains to each category of inhabitants in India. 4 new trains have been announced in the last rail budget that is likely to cover all types of travellers who prefer to take trains for their journey. Starting with Antyodaya, designed for the economically backward people and end up with Humsafar Train for the middle class yet plush express train, the government is all set to give immense quality of journey to each traveller in the country. Humsafar Trains are for the middle class category with fully AC 3-tier coaches. It will be a long distance superfast train with various other amenities. Humsafar Express will be a fully AC express having III-tier coaches. It will be a long distance train where traveller can take an overnight journey. There will be a handful of amenities available in this train that are not there in any general mail trains or express trains in India. GPS and CCTV cameras are the two highlighted amenities that Humsafar will offer the travellers. Along with these there will be mobile or laptop changer points, fire and smoke detector and such. 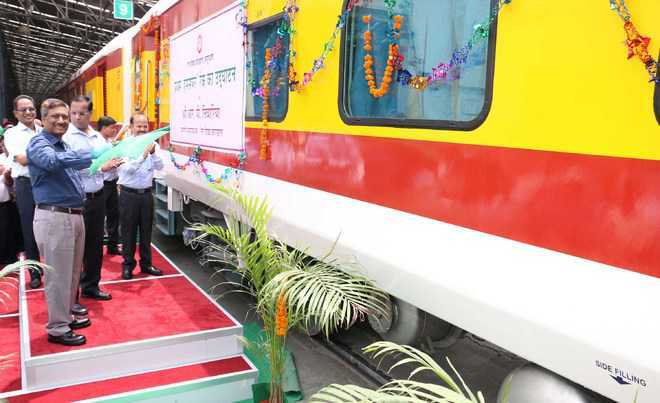 Humsafar will be launched in October 2016 and the railway authority has planned to start the train following the route New Delhi – Garakhpur. The train will offer optional meal as well. There will be a pantry car where you can order your food for dinner or breakfast. The body of the train will be the modification of Linke Hofmann Busch type and on the outer part coloured vinyl material will be used to give it a colourful and trendy look. The fare will be little more than any other normal express trains. But still the fare will be lower than the Rajdhani Express, Shatabdi or other lavish trains in India. As mentioned there will be a bunch of facilities will be offered in the Humsafar Train. These facilities are not available in any other mail or express trains in India. Along with comfortable coaches, fully AC and phone/laptop charger the train will also have GPS supported system, close circuit cameras and bio-toilets. The bio-toilets will not let the trains to ruin the tracks. The trash will be deposited in a different tanker attached with the train. There will be odour control system in each toilets so that it does not create any bad smell after use. The train was proposed in the last February during the rail budget presentation by the Rail Minister Suresh Prabhu. The Train is all set to launch sometimes in the month of October 2016. The first route Humsafar will follow is from New Delhi to Gorakhpur. The inter city overnight journey has planned for the train at the first place. As per the sources the train is offering so many modern amenities that no other express or mail trains offer at this moment. So it is true that the cost of maintaining such train will be more than any other general express trains. It has been said that the price of the Humsafar Train tickets will be 20% more than what people are paying at this moment for other trains. The train will give the traveller immense satisfaction as there is a bunch of plush facilities but on the contrary there will be high price as well. However the price seems to be lesser than what Shatabdi, Duronto or Rajdhani is offering. So as of now the ‘train for middle class’ is going quite well with Humsafar.